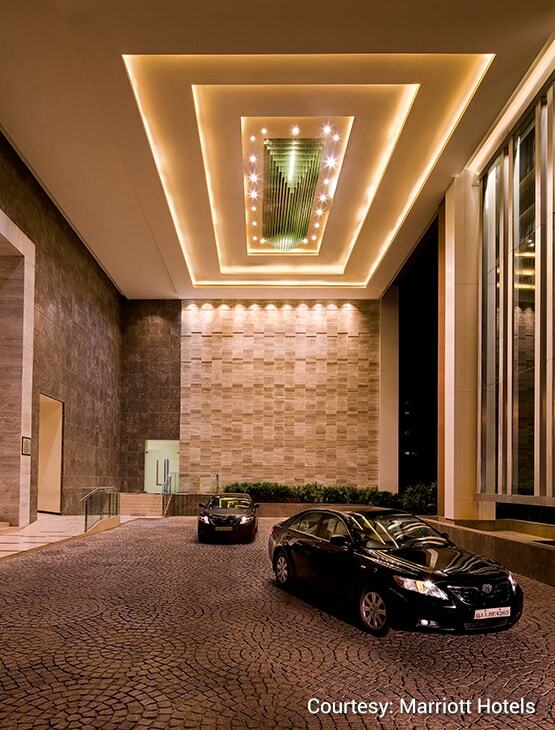 Located in Ahmedabad’s business district, the 164 roomed property has easy access to the airport and several entertainment options. 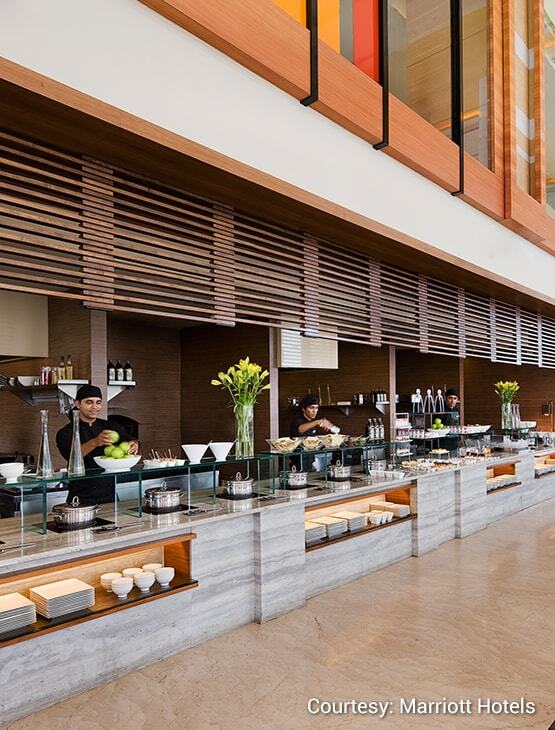 The hotel boasts of a selection of restaurants such as Java+, the laid back European Café and the MoMo Café which features delicious international fare for breakfast, lunch and dinner where the chefs work their magic in the open kitchen. The Indian restaurant, Bayleaf offers kebabs and curries. It also hosts a retail liquor store B&W which supports 300+ labels. Club Marriott offers more at your fingertips; more access to a range of select facilities, more fun at exclusive member events, birthday rewards and kids' surprises, more flavor with year – round savings on fine dining at restaurants across Asia Pacific, more value with our special members' accommodation rates. One (1) diner per table – 20% off. Two (2) diners per table – 50% off. Three (3) diners per table – 33% off. Four (4) diners per table – 25% off. Five (5) to twenty (20) diners per table – 20% off. 20% off on all beverages. Member’s Day on Mondays – Avail a 50% off on the total food bill and a 20% off on the total beverage bill over lunch or dinner at MoMo Café for up to a maximum of ten (10) guests. 20% off on Spa services. 20% off on the Health Club membership. 20% off on Board Room Usage. One (1) certificate entitling the Bearer to a 100% off on a buffet meal for two (2) guests at MoMo Café. This benefit is not valid over Sunday Brunch. One (1) certificate entitling the Bearer to a 100% oﬀ on a buﬀet breakfast for two (2) guests at MoMo Café. This benefit is not valid over Sunday Brunch. Two (2) certificates entitling the Bearer to a 50% off on the total food bill and a 20% off on the total beverage bill over lunch or dinner at MoMo Café or Bayleaf for up to a maximum of fifteen (15) guests. This benefit is not valid over Sunday Brunch. Two (2) certificates entitling the Bearer to a 100% off on a Chocolate Cake (max. 1 Kg), while dining at any of the restaurants at the hotel. One (1) certificate entitling the Bearer (child below the age of 12 years) to a special refill cup from Java+ offering an unlimited refill of soft beverages. This benefit is valid for one child. One (1) certificate entitling the Bearer to a 100% off on a one night stay in the base category of rooms over weekends (Friday, Saturday or Sunday). This benefit is valid for two (2) guests and is inclusive of buffet breakfast. 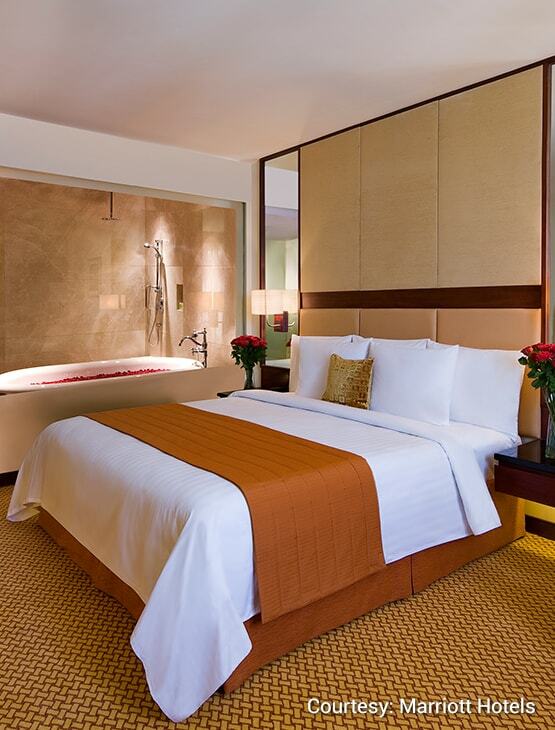 Two (2) certificates entitling the Bearer to a 50% off on the Best Available Rate on the base category of rooms. This benefit is valid over weekends (Friday, Saturday and Sunday) for a maximum of three (3) consecutive nights per certificate. Two (2) certificates entitling the Bearer to an early check-in (10 am) or a late check-out (5 pm). One (1) certificate entitling the Bearer to a 100% oﬀ on a one night stay in the base category of rooms over weekends. This certificate can also be clubbed with the ‘Happy Getaway’ certificate (100% oﬀ on the room rate) of the first level of membership to avail of an upgrade to a one night stay in the base category of Suites over weekends (Friday, Saturday or Sunday). Two (2) certificates entitling the Member to a 100% off on a 15 minute Reflexology treatment or a 50% off on any service at the Salon. This benefit is valid for one (1) guest and is subject to prior reservations and availability. Two (2) certificates entitling the Member to a 100% off on the use of the hotel gymnasium for two (2) guests for up to a maximum of four hours. Three (3) certificates entitling the Member to a 100% off on the use / access of the Swimming Pool area for a family of two (2) adults and two (2) children (below 12 years of age) for a maximum of two hours. House rules apply. 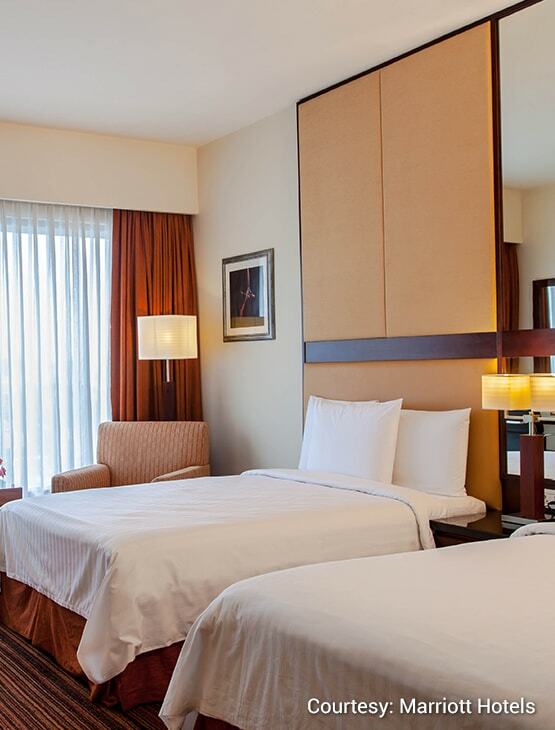 Up to a 20% off on the Best Available Rate on the base category of rooms. 20% off on the food and beverage bill at the restaurants for up to a maximum of ten (10) guests. Five (5) certificates offering the Member a 30% off on accommodation on the Best Available Rate on the base category of rooms, valid for a stay of a maximum of two (2) consecutive nights per certificate. 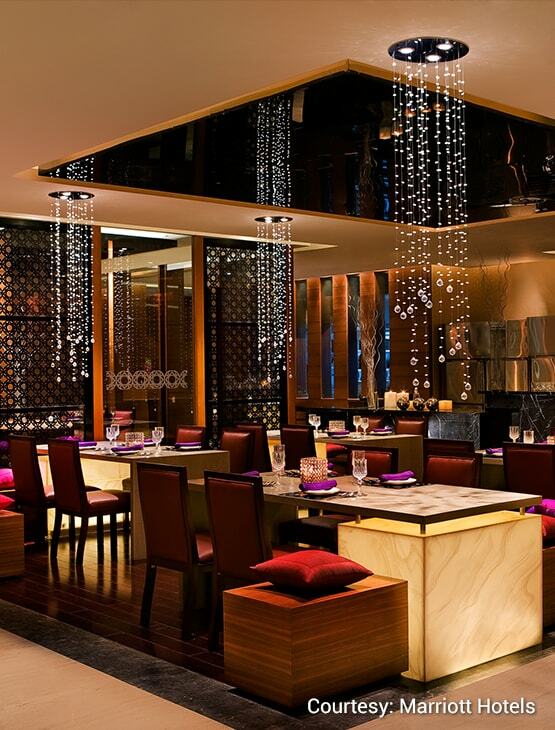 Up to a 20% off on the food and beverage bill at the restaurants for up to a maximum of ten (10) guests. Savings on premium wines and spirits are offered at select hotels only. 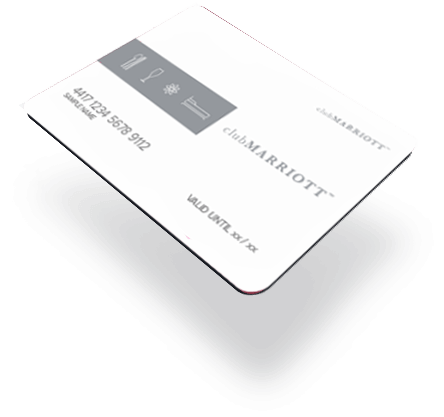 Club Marriott is a program that offers dining and accommodation privileges at participating hotels of Marriott International. The membership term (validity period) shall be 12 calendar months from the date of issuance of the membership. The membership card and the vouchers are valid as printed and cannot be extended or revalidated. These cannot be replaced if lost or stolen. The membership card and the vouchers have no cash value and cannot be traded for any other service. The membership card is not transferable. Only one Club Marriott Card can be used for one dining group up to ten (10) guests. The total amount of the membership fee will be refunded, provided the membership has not been used and the refund is requested by the Member within 15 days of acceptance of the membership. The refund will only be actioned after the receipt of the membership card, all the vouchers and a written cancellation request. Presentation of the Club Marriott Membership Card is imperative for availing the discounts and benefits under this program. Terms and Conditions of participating hotels, restaurants and membership benefits are subject to change without prior notice. Please refer to www.clubmarriott.in for the latest updates. Marriott Hotels India Pvt Ltd reserves the right to add, modify, withdraw or delete any of the benefits, rules, terms and conditions and the duration of the program, with or without prior notice. All decisions in this regard will be final and binding on the members of the program. Fraud or abuse concerning the program membership is subject to appropriate administrative and/ or legal action by Marriott Hotels India Pvt Ltd including termination of the membership. Lost or stolen membership cards must be immediately reported to Member Help Desk. An administrative fee of Rs. 500 will be charged for a replacement membership card, which will have the same expiry as the original membership card. Club Marriott shall not be liable to any amount greater than the membership fee to any member as a result of his or her membership. Without prejudice to any other mode of proof, through the payment of the Club Marriott membership or the use of the membership card or any of the vouchers, the member accepts these terms and conditions, as amended from time to time and agrees to be bound by them. In the event of a dispute, Marriott Hotels India Pvt. Ltd. reserve the right for final interpretation of these terms and conditions. It is recommended to make a reservation in advance clearly stating the use of the membership benefits at the Hotel to avoid any disappointment on arrival. Therapy treatments require a prior reservation of 24 hours. If you wish to avail of GST Input credit (as per the provisions and conditions under GST Law), we request you to send us your GST Registration number, Company Name and GST Registration State within one week of the receipt of receiving the membership package, so that we can update our records to enable you to take an input credit of the GST amount on the membership fee, if applicable. Marriott reserves the right to deny a membership to any individual without assigning a reason. Membership discounts are available on a table of a maximum of twenty (20) guests. These are not valid for banquets. To avail of the dining discounts, the minimum requirement is that two (2) food items must be ordered. This discount can be availed on the total food order and only one card will be accepted per table / per visit. Discounts cannot be given in conjunction with any other special promotion or discount program. The value of the specific discount shall not include central, state, local taxes, off-premise, takeaway or room service orders. Card discounts and vouchers are not applicable during Christmas Eve, New Year’s Eve, Valentine’s Day, Independence Day or any other day as specified by the hotel. On Sunday brunches, the Membership Card entitles the guest to regular discounts on the food component of the brunch price and a 20% discount on the beverage component of the brunch price. All reservations are subject to room allocation availability. Room bookings must be made with the Club Marriott Member Help Desk or online on www.marriott.com by quoting the corporate promotional code, ‘EMM’ under the section Special Rates & Awards. 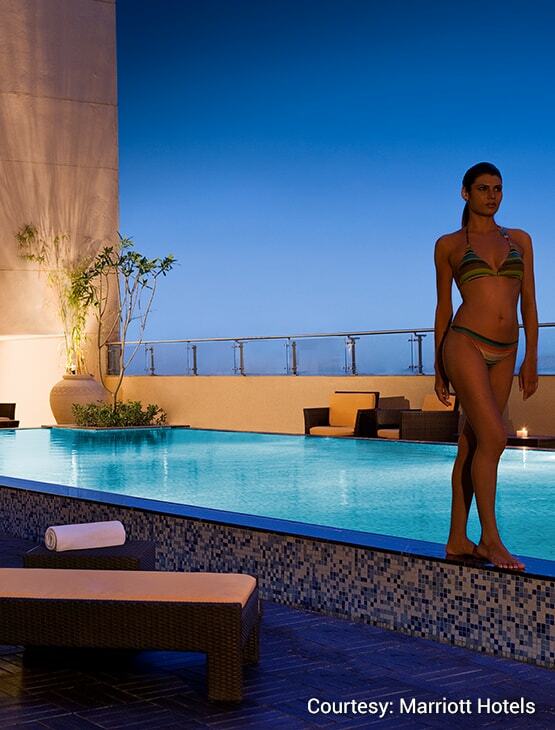 Reservations can only be made within 15 days of arrival or as stated on the vouchers. Black-out dates may apply. reservations or discounts under this program. All reservations under this Program are non commissionable. Amendments or cancellations of room reservations must be made with a 72-hour prior notice. Hotel Cancellation Policy will apply with respect to retention charges. Please surrender the relevant accommodation voucher and present valid photo Id’s of both the occupants of the room to avail of the accommodation benefits. Early check-in, late check-out or specific room type requests are subject to availability and cannot be guaranteed at the time of reservation. All certificates enclosed are for one-time use only, must be surrendered at the time of arrival, have to be utilized in full and cannot be exchanged for cash or any other service. The benefits given in the certificates are accompanied by the terms and conditions given on the face and on the reverse of the voucher. All house rules are applicable on usage of the health and spa certificates. Fill the fields below to get more information. All fields are required. Hotelmemberships.com, TLC® Relationship Management (P) Limited and its group companies, collectively referred to as TLC ® provides its content on this Web site subject to the following terms and conditions. The Site is subject to periodic updates and revisions, so material provided should not be considered as current. Information provided on this Site is meant for broad comparatives of membership offerings by different Hotels. Some membership benefits, terms of usage etc may not be updated and hence all Visitors are advised to verify the membership benefits directly from the hotel before signing up for any membership. All content and functionality on the Site, including text and TLC® logos are the exclusive property of TLC ® respectively and protected by Indian copyright laws. All rights are reserved. TLC ® grants you a non-exclusive, non-transferable license for the term hereof to access and download, display, and print one copy of the content and functionality displayed on the Site (the “Site Content”) on any single computer solely for your internal, business use, provided that you do not modify the Site Content in any way and that you retain all copyright and other proprietary notices displayed on the Site Content. You may not otherwise reproduce, modify, distribute, transmit, post, or disclose the Site Content without TLC ® prior written consent. You may also not interrupt or attempt to interrupt the operation of this Site in any way, post any obscene, defamatory and annoying material on the Site or obscure any material already posted on the Site. TLC ® prohibits the posting of any information that infringes or violates the copyright rights and/or other intellectual property rights (including rights of privacy and publicity) of any person or entity. If you believe that your intellectual property right is infringed by any content on the Site, please write TLC ® Corporate Office address at 501 Salcon Aurum, Jasola District Centre, New Delhi 110 025 respectively for our review. The content and functionality on the site is provided with the understanding that TLC ® is not herein engaged in rendering professional advice and services to you. all content and functionality on the site is provided “as is,” without warranty of any kind, either express or implied, including, without limitation, implied warranties of merchantability and fitness for a particular purpose. TLC ® shall not be liable for any indirect, incidental, consequential, or punitive damages or for lost revenues or profits, whether or not advised of the possibility of such damages or losses and regardless of the theory of liability. These Terms are governed by the laws of India and the jurisdiction of the Courts of New Delhi. Hotelmemberships.com and its group companies protect your privacy when you use our websites, receive emails from us or participate in our loyalty programs. With the acceptance of any of the memberships or marketing promotions sold or marketed by Hotelmemberships.com or its group companies, an individual member agrees that they can be contacted to receive information about the program benefits, special offers and new developments via phone, email, SMS or letters. Hotelmemberships.com has access to your personal information which may be shared within its group companies or partners under strict privacy controls. If your personal information is not provided it may not be possible to manage your membership effectively or at all. This Policy is part of the terms and conditions of the membership program you enroll for (as detailed in the program brochure) or any marketing promotion run by Hotelmemberships.com or its group companies. By using our Website or taking part in the Programs, you are expressly agreeing to our terms and conditions, including the terms of this Policy. If you do not consent to the collection, use, disclosure, and transfer of your personal information as described in this Policy, you may not use our Website and you may not participate in the Programs. As used in this Policy, the term ‘personal information’ means information that identifies you personally, either alone or in combination with other information provided by you and now available with us. This information typically includes your name, mailing address, telephone numbers, e-mail address and other information needed to manage your membership effectively. We use your personal information to administer the Program, respond to your queries and communicate with you about Program and partner services and information. If you choose not to receive any promotional communications from us, we will not send you promotional messages and will not share your personal information with our partners or other companies for marketing purposes. We may still contact you for administrative purposes, such as confirming a transaction you may have made, informing you of your Account status, informing you of important Program changes, or inviting you to reconsider your privacy preferences. In order to discontinue receiving all communications from us, please get in touch with our Privacy Officer at PO Box 3640, New Delhi – 110 024, India. We keep your personal information for as long as we need it for the purpose for which it was collected. Generally, this means that we will keep your information as long as you are a member with any of our programs. In case you cease to become a member, we will retain your details for 12 months so that you can easily rejoin when you wish to. We maintain appropriate physical, technological, and organizational safeguards to protect your personal information against loss, misuse, unauthorized access or disclosure, alteration and destruction. Only authorized personnel have access to member Accounts and details. Although we use reasonable measures to help protect your personal information, it is important that you understand that no website or database is completely secure or “hacker proof”. If you believe the security of your Account has been breached, please contact us immediately. To administer our Web site and for our Email campaigns, we track and analyze anonymous usage and volume statistical information from our visitors and members. All data collected are owned and used solely by us or on behalf of our marketing partner. Such information is shared externally only on an anonymous, aggregated basis. We use clear gifs, also known as “Web beacons”: tiny graphics, with a unique identifier that help us to improve the visitor experience, to manage our site content, and to track visitor behaviour. The data can help us, for example, in controlling access to certain content on our site and in alerting users to new site content and services. This information is shared externally only (i) in anonymous, aggregated form for generalized user analysis, (ii) to review whether users qualify for additional benefits, or (iii) to enable us to send e-mails to you on our behalf. We may provide links to third-party Web sites. Please be aware that we cannot control and are not responsible for the information collection practices of such third-party Web sites-policies that may differ from those of this Site. We encourage you to review and understand the privacy policies of these other Web sites before providing any information to them. You may access, correct, update, and/or delete any personally identifiable information that you submit to us. You can unsubscribe from our Emails by a click through on each email. You may also unsubscribe from mailing lists or any registrations on the Site. To do so, please follow the instructions on the page of the Email. Hotelmemberships.com has implemented generally accepted standards of technology and operational security to protect personally identifiable information from loss, misuse, alteration, or destruction. Only authorized Hotelmemberships.com personnel have access to personally identifiable information, and these employees are required to treat this information as confidential. Despite these precautions, Hotelmemberships.com cannot guarantee that unauthorized persons will not obtain access to your personally identifiable information. Personally identifiable information collected may be transferred, from time to time, to Hotelmemberships.com offices or personnel or to third parties located throughout the world, and the Site may be viewed and hosted anywhere in the world, including countries that may not have laws of general applicability regulating the use and transfer of such data. Please categorize your search a little bit more in order to give you proper results. Your comparison list is full. Please, remove one (1) card. Please add minimum 2 cards for comparison.